I recently ordered and received a set of silicon wine cups. 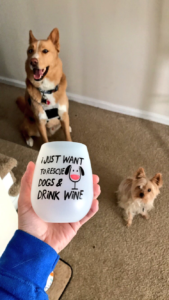 These cups have an adorable message painted on them that says, “I just want to rescue dogs and drink wine.” Along with the quote, it also has a wine glass picture that resembles a dog. I first saw these cups on a Facebook ad. Although, I didn’t purchase them just yet. It wasn’t until a few days later when a sponsored advertisement displaying these same adorable silicone wine cups popped up on my Instagram feed. Being a marketer, I know it isn’t a coincidence that the advertisements cater to the types of products that I like, which in this case happens to be dogs and wine. These social media advertisements track what I view on the internet and my recent searches. However, I just couldn’t resist the consistent call to action that lured me into clicking the company’s link. Once I visited their social media page, I learned more about the company and realized that they stand for a much bigger cause than just trying to profit off of their products. Instead, all of their products support animal shelters and dogs in need. I journeyed on to their website and was really impressed with what I saw. On the website, each item is priced and labeled with what your specific purchase will support. For instance, a t-shirt on the site that costs around $24 feeds eight shelter dogs while an autism awareness bracelet that costs $17 will donate 20% of its sales towards training a rescue service dog to help a child with Autism. There are dozens of products on this website, and each item supports a specific dog cause. I read about the company’s mission, watched the video below, and instantly wanted to support this company. Not only would I receive a neat product, a set of cute silicon wine cups, but most importantly, my purchase would help feed five shelter dogs. 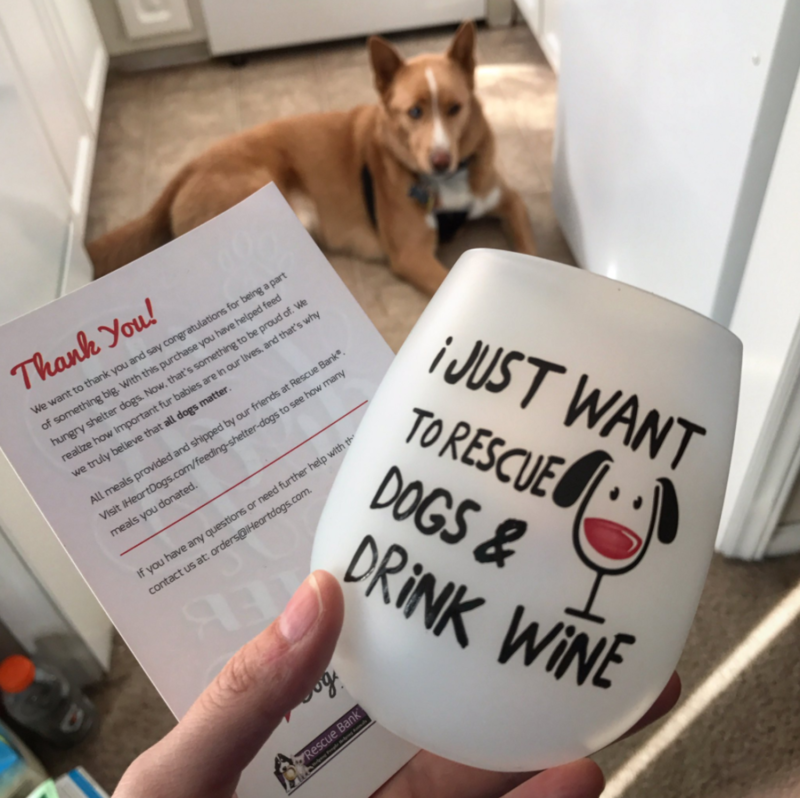 Being a big animal lover that enjoys the delicious taste of wine, I was thrilled to receive my package in the mail with these awesome cups. I was even more excited to be able to share this purchase on social media and hopefully influence people to check out the site for themselves and become a part of this movement to help these animals. This company does a great job expressing their appreciation of their customers for purchasing from their site. Not only do they send emails thanking the customer and letting them know what their purchase specifically supports, but they also send a thank you card with each package. I know in the future I will be purchasing more items for myself and my sweet dogs through this site, and I encourage you to do the same to support this great cause. I absolutely love my new wine cups and the purpose behind this company’s products, and I’m sure you will too! Even if you aren’t a dog person, they have similar sites for other animals such as cats, horses, and birds! So, what products do you get behind? I’d love to hear about companies that you love to buy from who support a specific cause. Leave a comment on this post with some of your all-time favorites! Yes, you read the title correctly. I am talking a dog walking class at East Carolina University. It sounds silly, but I can assure you it is more valuable that you may initially think. It’s my senior year at ECU, and on top of the required courses I need to complete prior to graduation, I also had a few extra hours to fill. 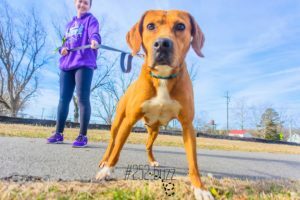 In previous semesters, I heard rumors about a dog walking class at ECU. As most of you may know, dogs hold a huge place in my heart. So naturally, when I had the opportunity to pick any class that I would like to take during my last semester in college, I picked this course. 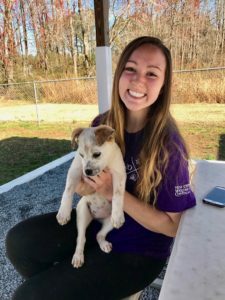 Every Monday, Wednesday, and sometimes even on Friday mornings, I meet with a group of ECU students at the Pitt County Animal Shelter. There are always many dogs at the shelter that are ready to get out of their kennels to go on a walk. Some dogs have been at the shelter for a while and others are new arrivals that came in as a stray or an owner surrender. Every morning when I arrive at the shelter, I always pet each dog before going to the back of the building to grab a collar and leash. Each student has the opportunity to pick one of the dogs to walk for the day. We take the dogs out for an hour long walk and spend time with the individual dog that we chose for the duration of the class. After the walk is complete, we then give the dogs a treat. Sometimes, if there are puppies at the shelter, we get to play with them after we complete our walk with the other dogs. As you can see, this class is a lot of fun. Especially if you are a big dog person like I am. To some, this class is just another opportunity to obtain credit hours. However, for me, it is so much more. Not only do I get the opportunity to spend time with these sweet animals, but I also get to make a difference in their lives. Shelter dogs tend to become “kennel crazy” when they are confined too long, especially in a stressful shelter environment. So, the more exercise they receive, the better they behave and the higher the chance that they will be adopted. 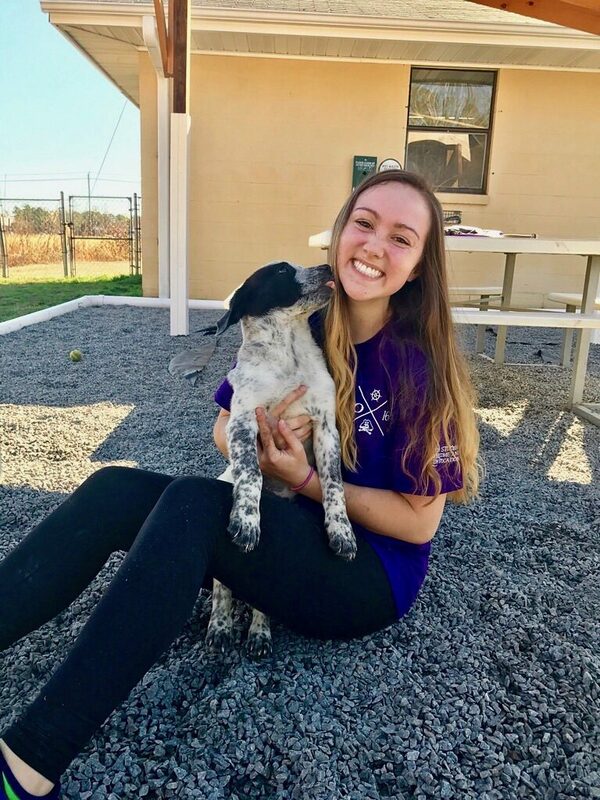 This is why shelter volunteers are so crucial because these individuals are able to give the dogs a break from their shelter confinement and have genuinely caring human interactions. 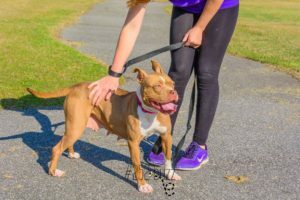 Check out this video to learn more about Pitt County Animal Shelter and their mission. As you can see, volunteers can make a huge difference in the lives of these animals. If not for us, these dogs wouldn’t obtain the proper exercise, love, and care that they truly need in order to find their fur-ever home. Now you know why this dog walking class is so much more valuable than just a few extra course credit hours. I always look forward to going to the shelter so I can walk these precious animals. If you’re looking for a good service opportunity that is very rewarding, I highly recommend volunteering at your closest animal shelter.